I have a lot of projects that I am working on right now. I am worried about posting too much material or having too many things going on at once. I know that I may lose interest in any project at any time and get excited to go on to the next one. Right now I have my biggest project, Just Fair 2011 set just getting off the ground and I have been doing random other things including “Listen To…” “Custom Card of the Day” “Greatest Hits” and an occasion music review or Royals review. I am going to attempt to stay focused but I also want to mix it up a little at the same time. So now I premiere something I am very excited about; The History of Joakim Soria. The project is obviously based around Joakim Soria. 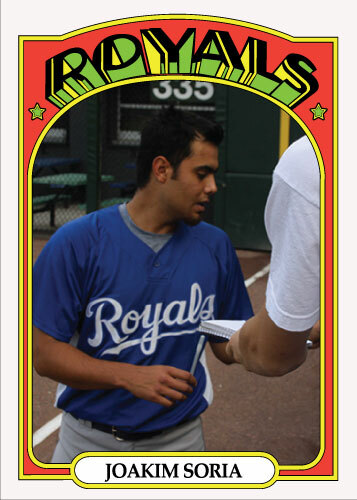 The plan is to build a Joakim Soria custom card for every year Topps has existed. This is a daunting task as many of the designs are difficult to replicate and Topps has been around for over 50 years so there are many cards to create. I have already done around 25 years for the History of Joakim Soria project. Why Soria? Simple, he is now one of the longest tenured Royals players and there a plenty of photographs online available of the guy. Plus I am a big fan of his. As of now I am being as true as possible to the design of the card but not worrying too much about matching the picture type to what the set was like. All pictures before 1971 were poses of the players. It would be difficult for me to created this many cards(around 15) using only poses. Here is the first card of the project, 1972 Topps. It is a gaudy design. I really don’t like it much but it is a set you don’t see often and not many custom cards are available for this set that I have seen. The shocking part about this set is that it came after possibly my favorite set of all time; 1971 Topps. 1971 had the black border and very simple design, then they came out with this? Either way it is interesting to see Soria in the 1972 design. If there are any you would like to see posted next, I would be happy get them posted. Also on my site I am completely open to sharing my templates. If you want one, just comment and I will send you what you need. I’m really looking forward to see where you go with this. I haven’t even attempted some of the Topps designs from the mid-’90s through today, just given the complexity of the templates. I’ll be eagerly following along! Yes, the new designs will be very tough, the worst part for me is matching the fonts on the cards. I don’t have many new ones done but I will throw one up in the next couple days that I do have ready to go. This is awesome! I’ve been trying to re-create the 1972 card for a while. I just cant seem to get the font right. Could you possibly share yours? I’d be glad to but it ins’t a live font for the team name, I had to individually trace each piece. If it would help you out let me know and I’ll send it over. 1972 Topps is a tricky year, somehow ugly as hell and kind of cool at the same time. Thanks Howie.